In life, we make sacrifices. Some are worth it, some are not. Worth it: Sacrificing those doctor-ordered eight hours of sleep every night to write your magnum opus (get after that Boba Fett fanfic, girl! ), or to watch The Talking Dead after your fave show, or to vanquish Ganon in that old Zelda game you've finally resolved to complete. It's worth sacrificing a few friendships if they are a detriment to your mental and physical well-being—or of course if those friends discourage the above. Likewise, saving the galaxy, or ultimate power (your choice), might be worth losing your hand. Screaming "it's a trap," like a shot of adrenaline to the heart, is sometimes worth losing your dignity. Sometimes! Sacrificing a few weeks' lunch money is worth that super rad, ultra-authentic red lightsaber. A weekend in Dagobah here and there is definitely worth harnessing an awesome power like the force. This next one's especially important! Don't sacrifice your comfort to dress to impress as Darth Vader this Halloween. We know you'd rather not walk around in a metal power suit (your makeup is on point, so why would you?). Don't go slashing things with that lightsaber just yet, lady! We've got the hookup. 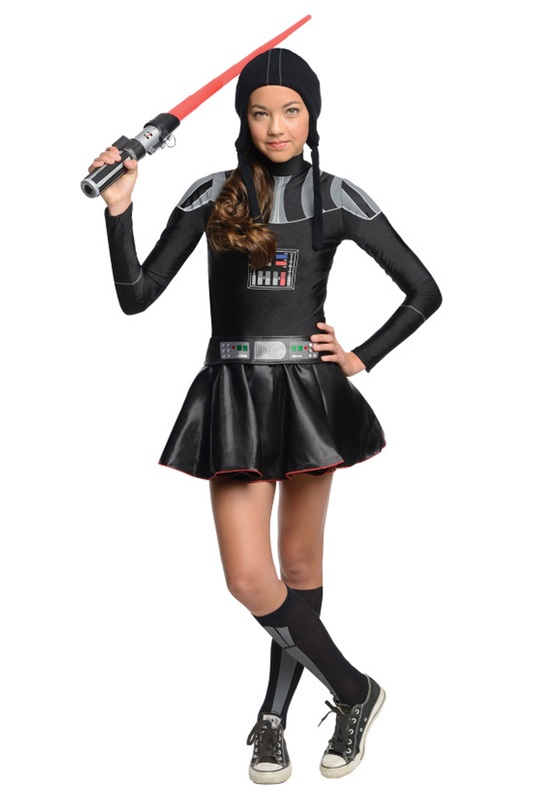 Slip into this Darth Vader dress costume, featuring a printed top and socks paired with a sassy satin skirt, and you'll be all ready to rule the galactic empire—comfortably, fashionably, and mercilessly.